Scenario: You’ve opened up your Apex Legends account – the one whose price you recently checked via our Apex Legends account calculator — and now, you’re ready to start your day with your fellow squadmates. So far, your team already has a tank, a damage dealer, and an assassin. All you need is a healer to back your friends up during times of trouble, but you can’t quite play your best since being a medic or a support is out of your league. Well, it’s time to step out of your comfort zone my friend! With our guide, you’ll learn how to master Lifeline, one of the most impactful characters in the game, and grasp how she operates within the team. Lifeline is a support-oriented hero. When playing as her, you always have to be there with your teammates to make sure they stay healthy. Her abilities, albeit not exactly combat-focused, are crucial enough for team survival in sticky situations. Here are her abilities that you should know by heart if you want to use her moves wisely. Lifeline will revive a downed teammate faster than other characters and will also deploy a personal shield while doing so. She also uses healing items 25% faster. Do note that the shield covers only the front area of Lineline, so be sure to have at least some kind of cover behind her back. Otherwise, it will be too easy for enemy players to disrupt the process. Furthermore, the shield protects only from bullets and missiles, but it cannot prevent players from passing through it. Be wary! Lifeline can deploy a healing drone that will automatically heal all damaged teammates within its range. The drone, however, can be easily destroyed by one precise sniper shot. Place a drone behind your allies who have already positioned themselves for cover and healing purposes. The best timing for dropping the D.O.C. Heal Drone is before or during replenishing shield, right after a shootout, or during looting sprees. Lifeline’s ultimate ability is a special one, as it allows her to trigger an airdrop that contains high tier armor—or even a legendary weapon. This ability is essential for the survival of the team, so don’t waste your team and trigger the care package haphazardly. In order to activate the Care Package, you must provide plenty of free space for it. Since her ultimate ability requires a large space, expect that it’ll draw a lot of attention to nearby enemy players around you when using it. First off, Lifeline is not a fighter. She cannot compete with other damage-dealing characters such as Bloodhound or Mirage in combat, so you shouldn’t attack opponents first. It is best to position yourself behind your teammates, but be on the lookout for sniper and assault rifle-equipped players since they can knock you out rather easily. During the drop phase, try to be as close to your squad as possible. Although you may not be able to get the best loot right after landing since your teammates will need it more than you, teamwork makes the dream work. Also, remember that Lifeline is a very valuable character in any squad composition, because without a medic, the chances of survival are greatly reduced. Always take care of yourself and don’t risk your life just for a shotgun you wouldn’t need anyway. If your team loses you, then it’s more or lessa sure loss for the whole team. Use your tactical ability effectively. Lifeline’s healing drone can save your team a lot of time, because now they won’t need to collect syringes and medkits anymore. But this drone shouldn’t be dropped without careful consideration; it’s best to look for places where it will be more or less protected from the enemy assault. The D.O.C. drone can also be used for Lifeline herself in case you find yourself cornered in a shootout. With the help of the drone, you will stay alive a lot longer and you may even kill a few enemies in the process as well! That’s about it on how to play Lifeline on Apex Legends. If you haven’t tried her yet, I recommend booting up your PC to try her now! She’s a fun and quirky character to play as, and her nimble figure makes her hard for enemies to pin down. If you want to learn more about how much your Apex Legends account is worth, then we recommend you try our Apex Legends account calculator to break down the specifics and come up with a number that’ll be your selling price should you decide to sell your account. Apex Legends is a beautiful team-based battle royale game that EA masterfully delivered together with Respawn. It also comes with some unique concepts compared to other similar games, and one of them is the introduction of character classes. And we’re going to talk about the best characters / classes in Apex Legends in today’s article. We will actually share our own Tier List, ranking the classes from the worst to the best. You won’t always get the chance to pick the best class (or the one that suits you best), but at least you will have a few other solid options. And now you will know which these are. You’d think that a character that must be unlocked with a ton of credits would be anything BUT the worst possible class in the game, but here is Caustic who’s pretty much useless. The thing with him is that all his skills, including the Ultimate, revolve around his Nox Gas. Which, in theory, is a good thing: it takes enemies out and warns you when enemies pass through the area. The biggest problem, though? This requires a lot of planning and passive play (aka camping). Having in mind that the play field also shrinks constantly, this makes it even more difficult for Caustic’s skills to actually make a difference. This does change a bit in late game situations, if you manage to make it to those stages, where the Nox Gas Trap and the Gas Grenade can really make a difference, but there are still better and more fun characters to play than him. Support characters – especially medics – have always been the least popular choices in online games and unfortunately Lifeline doesn’t really shine to change how things stand. Yes, it is true that she is perfect as a support character and she might work out better if you play with your friends and everybody has a specific role – and you stay together, for crying out loud! If you play alone, the random matches can make Lifeline completely useless due to their way of playing the game. The Ultimate skill is pretty useless too: the defense gear comes a bit too late in my opinion and there are much better things to have as ultimate skills to change the fate of the game. The care package is not one of them. For some reason, I thought that Bangalore is a really great character to play as and as a result I did play a lot as her early on. But the truth is that she’s not that spectacular, even though I wouldn’t really call her bad either. There are just better choices out there. Her passive is pretty much useless since 90% of the time you’re being shot at you won’t be sprinting, but firing back or hiding behind cover. The smoke canister is good in specific situations and it can save your team’s life, while the Ultimate skill is good, but it can be a hit or a miss (usually the latter, unless you’re dealing with stationary enemies). Overall, playing Bangalore is not that bad, but there are also much better options to choose from in my opinion and much better boosts to take advantage of. Voices from the Void (Passive): You hear a voice when danger approaches. I’ve seen a lot of love for Wraith, but the truth is that I never was able to really play as her or get anything good done with this character. Plus, she’s creepy like hell! The biggest problem I have is with her Ultimate: linking two portals and being able to teleport sounds amazing in theory, giving you the opportunity to really take the enemy by surprise. But in reality, things will never work out like that and, just like in Caustic’s case, it takes a lot of planning and even more luck to actually make this work. The first two abilities are good, though and her tactical is one of my favorite in the game since taking no damage is a massive bonus if you have where to run to, but overall she’s just there at the middle: not the best, not the worst. Now, this guy is really good and although there are some improvements he could benefit from, he’s much better than other characters in the game. He’s a better support, in my opinion, than Lifeline thanks to his shield. Again, this needs a team of people who stick together and only works in certain circumstances (also if you’re all by yourself), but overall it works well. The passive doesn’t really help a lot long term though since you have to be aiming down when in a fight. If there’s no teammate to get the shooting done, you’re toast! The biggest downside of Gibraltar is that he’s so extremely slow. Speed is very important in a game like Apex Legends and he is lacking it – and this is why he’s not placed higher on our list. But overall, surprisingly good! The second character you can unlock in the game (and the first you should unlock). The thing is that all the clones are working flawlessly right now, giving you the ultimate advantage in the game. Things might change later on when people will probably be able to see who’s the clone and who’s not, but right now all his skills are absolutely amazing and you’ll have a blast playing as Mirage. He’s one of the most underrated characters in the game in my opinion. He has amazing skills that make one of the most important elements of the game a lot easier: knowing where the enemies are. His tactical skill is what really makes him so useful, generally from the mid-game to late game stages, when the players are crammed a bit more. Either way, whenever you know where the enemy is before they know where you are is a huge advantage. And Bloodhoud has that. The Ultimate is a bit disappointing and a bit of a solitary game (or it requires communication with teammates), but it’s still good. Overall, you’ll have a great time playing Bloodhound right now. This character is overpowered at the moment, in my opinion. And you can take advantage of his skills, to always end up on the winning team – especially if your teammates know what they’re playing and doing. You get a huge advantage from his passive skill which tells you where the next ring will be. In turn, this means that you and your team can move to a perfect camping spot in the area and prepare for the incoming enemies. Combine that with the fact that you can use a grappling hook to get to areas that other players can’t normally get to, then build a zipline for your teammates to get there and wait for the enemies to come… and you have a perfect character. I am pretty sure that because of his strengths, he will soon be nerfed, but until that happens, he’s the best choice out there, great even if your teammates are not great at team play! Since every character can equip the same items, it’s their abilities which makes them stronger or weaker than others. While your skill level will definitely influence how things go on the battlefield and they matter the most, some of these characters give you more bonuses than others. Of course, play style is important when deciding which character is the best for you, so do try them all – but maybe in the order that I have recommended. And if you think that the rankings should be different, let me know in the comment section below. Slay the Spire has 43 achievements that you can unlock, many of them being hidden. Today we’ll talk about them all though as I will share with you a complete guide to the Slay the Spire achievements (and how to unlock them all). Some are pretty much self-explanatory, while others are a lot easier when you know what to do. I think that this should go without saying, but I am saying it anyway: there are spoilers ahead, so if you want a spoiler-free experience (or you’re just starting to play the game), it might be a good idea to give it several hours without looking at a guide for achievements. It might ruin some of the fun and surprises. To help you get these achievements faster, we have also published some Slay the Spire tips and tricks: make sure to check them out as well for faster in-game progress. Now, with these in mind, let’s move on with this current guide and see how to unlock all achievements in Slay the Spire! Minimalist – Beat the game with a 5 card deck or smaller (a really difficult achievement to unlock. You could try to pair it up with The Transient to at least have a chance of scoring one of the two achievements if you fail with the other). And these would be the achievements in Slay the Spire, with some tips on how to unlock them. Most of the achievements listed towards the end are extremely difficult to obtain and in many cases you will probably need tens of hours of trial and error until you get them. Fortunately, the game is extremely fun and going through it over and over again is never boring. If you have some tips and tricks on how to easily get these more difficult achievements, don’t hesitate to let us know by commenting below. Slay the Spire is an insanely addictive deck building game with roguelike elements, one that will keep you glued to the screen for ages. And we’re here to help make that experience a bit more pleasant by sharing some Slay the Spire tips and tricks in our complete strategy guide. The funny thing about this game is that when you look at it, you think that it’s nothing but a mobile game wrongly released on PC. That was my first thought and I almost didn’t buy it. But then I looked at all those Overwhelmingly Positive reviews on Steam and decided to give it a try. Best decision of the year so far! Slay the Spire offers a ton of depth and insane complexity, you have variety, you have character, you have everything you could wish for from a game. And now you’re about to get better at it from checking out our Slay the Spire tips and tricks below! Now, jokes aside, the truth is that especially early on, smaller decks are better than larger ones. Smaller decks are more predictable and easier to score on the synergy points. A larger deck, especially if you’re not particularly knowledgeable about the cards you’re using, will most likely have no synergy and it will be a lot weaker. Also remember that you are not actually forced to pick up cards or any type of loot from the one shown after a battle: you can simply move on without getting anything. This is important to know, as you can still control the deck that you have and make sure that the synergies stand and you have cards you know how to use and how to put to work. Finally, especially early on, if you don’t have a winning deck in mind, just add cards that make sense, focusing on the offensive aspect and instant benefits. In the end, you will indeed need linking cards and more advanced tactics, but first go for instant gratification until you get the hang of things. How many cards should you aim for? I personally believe that a deck of around 20 cards at the end is perfect, while working with up to 25 is also doable, although I wouldn’t recommend going that far. To make things more complicated, though, this changes during the Ascensions, but take everything one step at a time. Well, truth be said now, not all relics are great – some are actually pretty useless. The nice thing about deck building games, though, is that there’s not really a “great relic to rule them all”. Instead, things depend a lot on the type of game you’re playing and the deck you’re building. Either way, one thing you should focus on is fighting those Elites to grab their relics. Elite battles will always have a relic and unless you lose all or most of your health fighting them, it’s worth going for. Finally, remember that you can also get Relics without fighting Elites! You can do so from the Merchant. You don’t have a lot of options and they are insanely expensive, but have that in mind in case you want to (and afford to) boost your stats a bit. Most relics are great, so at least check out the offer! Back to the question of this subtitle – which are the best relics in Slay the Spire? Apart from those that directly help your current deck setup (which vary from build to build), I would like to mention a few really important ones that are generally useful no matter what. Probably the best – even though with limited effect – is the Juzu Bracelet. If you get it, you will have no monsters in ? rooms, which makes the whole game a lot easier (and makes choosing a path easier too). If you’re just starting and you are defeated a lot, the Lizard’s Tail is also great since it revives you with 50% HP. This is extremely useful when it comes to running longer than you might otherwise. Finally, a great card (but useful only if you have enough attack cards in your deck) is the Shuriken: this gives you a really useful +1 strength if you play 3 attack cards in a turn. Apart from these, all the other cards come with benefits but also penalties so it’s up to you to decide which penalty is best for your custom deck type. I personally recommend focusing on the ones that give you energy since that’s always useful. What are the best cards in Slay the Spire? Again, this is something to write tens of pages about, since it all depends on the path you want to choose, how well you know the game and how do you want to play it. As I have originally mentioned, if you’re just starting the game and trying to get the hangs of it, I think it would be easier for you to stick with smaller decks and go for cards with an instant effect. These will deal damage and make their presence felt as soon as you start playing as opposed to the ones that require other cards to work well. The latter are actually better for the long term run and late game stages, but first you need to get as far as possible, so focus on the instant effect cards. Great overall cards to mention here are Whirlwind (awesome card since it deals damage to all enemies), Rampage, but also Shrug it Off (extra defense and 1 card draw), or Warcry which gives you the option to draw 2 cards and decide which card from your hand you’ll draw next turn. Of course, when deciding upon a deck you’re building, the class you’re playing matters a lot. The top cards that I would recommend based on who you play are Limit Break for the Ironclad, Echo Form for the Defect and Noxious Fumes for the Silent. These go a bit more on the advanced planning stage, though. Choosing your path is also extremely important. We’ve already decided that paths with Elites are great to follow – but up to a point. That point is that if you can’t beat the Elites, it’s not really worth going that way. Also, depending on the relics you have, you might want to go more (or less) after ? – these are truly amazing, but again it all depends on the deck that you have (or relics, since we know already that the Juzu Bracelet makes monsters disappear). However, when things are not obvious, I would recommend going the safe way: Elites in Act 1 to prepare yourself for the later stages and afterwards the path with more campfires. Campfires are awesome because you get to restore some much-needed health, but also get the chance to upgrade your cards. Remember: you can only upgrade your cards once! There are exceptions to this rule, but unless it’s noted, have this important thing in mind. Another thing that you should know is that you health refills after a successful boss fight. So give it your best and don’t play to conserve health when you reach a boss stage! These would be all the strategies that we have to share with fellow Slay the Spire players. Do you have additional tips to add to the list? Don’t shy away and let us know by commenting below! If you ever wanted to either farm the Uber Labyrinth or simply wanted a Path of Exile Labyrinth guide (for the first timers or not), we have everything you could ask for right here in one article! This Path of Exile Labyrinth guide is going to reveal everything about the famous instance and all the trials that you have to go through to get to it. To kick things off, we are going to start with the very basics and then we are going to dive more into the end-game stuff, such as farming the Uber Labyrinth. So, without further ado, let’s dive right into it! There are four stages to the Labyrinth, each one of them progressively more annoying and difficult to deal with. However, the more difficult it is, the better the rewards, so that’s why many players choose to actually farm this as an end-game content or simply for the rewards and enchants. – The (Normal) Labyrinth: the very first player encounter with the Labyrinth, this is where you choose your Ascendancy class and get your very first two Ascendancy Points. It’s not that difficult if you have a strong char, but if you don’t have gears and go with the intent to finish the first Lab as soon as you unlock it, it might prove a little bit challenging. – The Cruel Labyrinth: this is the second stage of the Lab, where you get your next two Ascendancy Points. It will be much easier to the player, because by now you will have somewhat decent gears and some more skills to use. – The Merciless Labyrinth: this is the more budget friendly version of the Lab, which some people farm because you don’t need an Offering to the Goddess, and it gives some decent enchants. It’s somewhat difficult, but nowhere as close as the Eternal Labyrinth. From this you will get another two Ascendancy Points, and with those your Ascendancy Passives will be almost set in place. – The Eternal Labyrinth (also known as The Uber Lab): this stage of the Lab is the most nerve-wrecking one, the most annoying and difficult one – but you will have to do it eventually. 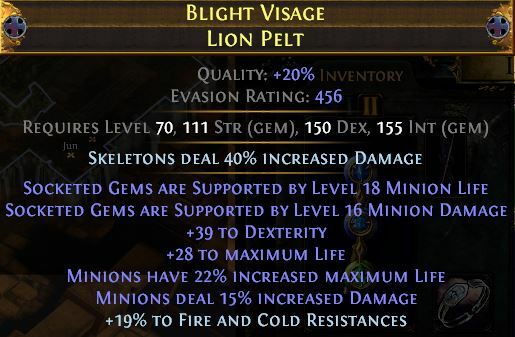 This gives good EXP for the high levels too (up to a certain level, don’t expect to farm Uber Lab as level 99 and expect to get a ton of EXP) and has the best enchants available (if you’re lucky). From this stage you will also get your last 2 Ascendancy Points, which will add up to a total of 8 points by now. 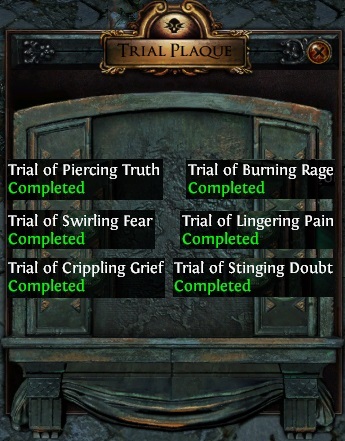 These trials can only be found in maps, and they spawn randomly. They can be somewhat “forced” to spawn with the prophecy “The Dream Trial”, but may not trigger in the first map that you open (after all, it’s all dependent on RNG). To further help you find trials there is also an in-game communication channel dedicated to finding these trials and much more (such as running Breachstones lately), and this is “/global 820”. By typing that into the in-game chat, your Global channel will switch to the respective one, and that’s where people share the Trials of Ascendancy for the Eternal Lab that they’ve found. As you will open the Lab, you will often miss out on some of the secrets this Labyrinth has. There you can find some hidden treasures, some secret passages and even extra Treasure Keys. You will most likely never find these rooms around the doors leading to other rooms, but rather by exploring the whole map. For this room you need to keep your eyes on the minimap (I suggest keeping it on the top-right corner in case you’re not doing so already), and looking at the available entrances. If you see that next to your character there is a wall, but further behind there is still room to explore, then you’ve found it. It can be activated by pulling a switch and when doing so, there will be a passageway opening through the wall that will reveal to you the certain room. Usually this room contains a Shrine (more details below) that will give you some buff which will make the Lab run much smoother, or even allow you to skip to the next Izaro fight. You will find this usually within the Iron Maidens or Sarcophagus or so, and this will allow you to travel a distance without actually going through the troubles of walking all that way. It will NOT get you past Izaro, so don’t even think about that. By finding and pulling the switch to this room, you are going to find a hidden room containing a Labyrinth Trove. This is going to drop any item that can be found in the chests at the end of the Lab which you open with a Treasure Key, but it doesn’t require one to open. It can be either super valuable, or complete trash (in my experience kinda useless). This room will be shown the same on the minimap as the one mentioned earlier, and that means you will notice that there is something to explore on the minimap, but you cannot access it by simply walking there. Once you pull the switch, a passage will open and will grant you access to the Labyrinth Trove. This is basically another switch (what a surprise!) that can be found between traps (usually the spikes in the ground) and once you pull it, it’s going to drop a large wall and enable access to another location within that room. This can only be found outside, in the Domain Enclosure, and it can be moved in order to reveal a secret passage that leads to the Basilica Annex. Works if you want to finish the Lab quick. In this section I will write all the possible ways of getting Treasure Keys, including the ones from Izaro. – When fighting Izaro, he will always drop at least 1 Treasure Key. If you don’t kill him quickly and rather let him have multiple traps at once, the encounter will get more difficult and he will drop additional keys. I have found that the more difficult the fight proves to be, the more keys he will drop, up to a maximum of 3 Treasure Keys. – You can look for Argus, which is Izaro’s “beloved” pet cat (no, not the cuddly ones you might imagine), which will always drop 1 Treasure Key. Argus can be found behind a door that has a slight green glow to it once opened, and doesn’t require any keys. – When opening a Curious Lockbox you will get 1 Treasure Key. This can be found by solving puzzles throughout the Lab or by passing through various traps in order to get to it. – You can activate the prophecy “The Emperor’s Trove”, and that will make Izaro drop an additional Treasure Key when defeating him (along with the ones he will normally drop). – The chests at the end of the Lab which can be opened with Treasure Keys, can drop additional Treasure Keys if you are lucky enough. – You can get lucky when touching a Mysterious Darkshrine and force Izaro into dropping an additional Treasure Key when defeated, along with the ones he normally will drop (plus the others that you might find along the way or with prophecy). The Silver Keys can be found in the Lab usually behind lots of well-assorted traps, and they can be used to open additional instances within the Labyrinth, which can only be accessed through the Silver Doors. A Silver Key will open a Silver Door, and you can’t use one key to open multiple doors. They aren’t mandatory in passing the levels, but can contain useful items (or complete trash). Behind the Silver Doors, you will find Silver Caches or Mysterious Darkshrines. The Gold Keys are a whole other story than their Silver brethren. The Gold Doors are usually a stage that you have to pass through in order to progress through the Labyrinth. To pass through the Gold Door, you will have to search for the “Annex” which contains its Gold Key that is required to open it. The Gold Key is also usually behind lots of traps, usually within a single room designed specially for that Key, and has no other exits. By opening the Gold Door you can continue to progress through the Labyrinth. A Gold Door can only appear once within the Labyrinth, while there can be multiple Silver Doors. – “Be twice blessed”: You will get an extra use of the Divine Font (you can enchant again). – “To the worthy go the spoils”: Izaro will drop an additional unique item at the end. – “Discover what lies within”: Izaro will drop an additional Treasure Key. – “Movement ceases, tension mounts”: Traps will be disabled in the final encounter. – “The heart quickens, the blood thickens”: Players take 50% reduced damage from traps. – “Restore that which was lost”: Players have increased Life (or Energy Shield) and Mana recovery. – “Courage stands tall“: Players have increased Size, Area of Effect and Life. – “None shall stop you”: Players have increased Armor, Evasion and Energy Shield. – “Deliver pain exquisite”: Players always deal Critical Strikes. – “Hit hard. Hit once”: Players have increased damage. – “Death doesn’t wait”: Players have increased action speed (movement, attack, projectiles). – “A portal to Izaro appears”: A portal opens to the next Izaro (as the name implies). The best way to do Lab if you want a quick run, is to always try and stick to the right side of the map. The correct path to Izaro encounters will usually be found by going this way, but if you want to look for the chests or keys, they aren’t going to appear here guaranteed. So for a quick run, sticking to the right side is good. But for the full run, with all chests opened and all rooms cleared, it’s not going to be the best. If you are looking to do this, you might also want to set your Pantheon to Soul of Ralakesh (minor god) for the decreased bleeding damage, since there are many traps that trigger a super annoying bleed which can drive you crazy. As for the major god, either Soul of Arakaali or Soul of Lunaris will do, your choice. Another thing I suggest for those of you who are doing Life builds, is keeping an extra Life flask with you (at least one flask) and have something to remove bleeding. It can be super useful when you want to face tank the traps and keep moving forward even when getting hit by them. Also, if you are carrying someone throughout the Lab, they don’t have to be in the same room as Izaro during the fights! They can just wait behind the door while the boss is getting killed, and simply join the room after (in case you want to be extra careful). These are all the Path of Exile Labyrinth tips I can think of at the moment, but if you know some other useful stuff, leave them down in the comments below!